Question: Neill, who is your direct supervisor while you’re learning to be a field producer at Mossy Oak Television? Neill Haas: Rusty McDaniels who's been working in Mossy Oak Productions for over 10 years. I'm learning a lot from him. Question: Neill, what have you learned the most about being a field producer for Mossy Oak television? Neill Haas: I’ve been in front of the camera quite a few times growing up but never knew about what goes on behind the camera and in the editing suite. Now, I’m getting a real cameraman’s education. The job of the cameraman has changed tremendously from the inception of outdoor television. In the early days, the cameraman just shot footage of a hunter taking an animal. But the position and its title have changed dramatically over the years. Today, the cameraman is now the field producer or the director of the hunting movie - totally in charge of all the activity taking place on a hunt. Responsibilities of this position are hefty between keeping the hunter, the animal and the video in line. Even if the hunter has an opportunity to take a record-book animal, he or she must be willing to let it go in the event the producer does not have the shot. This is tricky, as the producer must find a place prior to the hunt to film the bulk of the action without intruding on the hunt. The final shot may be less than one minute of the TV show, so the importance of building the story cannot be overlooked. Neill Haas: When I was in front of the camera, there was always someone telling me what to do or where to be. Through this process, I’ve learned the hunter is at the mercy of the field producer. Since the field producer of a TV show performs the same duties as the director of a movie, he’s the head of the videography, the editing crew, and the talent. He absolutely has to capture every detail required to make good outdoor television, which is a lot more work than one may imagine. This is the reason years behind the camera are required to become a stellar field producer. If anything goes wrong, most of the time it’s the field producer’s responsibility. Question: Neill, how do you like being the cameraman as opposed to being the hunter? Neill Haas: In the past, when I was in front of the camera, all I really had to do was follow the directions of the field producer and take the animal. Now that I’m behind the camera, there’s a lot more responsibility on my part. I don’t take the animal with my gun or bow, but I get the shot with my camera. I’ve really learned to love and understand the job of the Mossy Oak TV field producers. I feel very fortunate to have been given the opportunity to learn this craft. Twenty-three year old, third-generation Mossy Oaker Neill Haas is a field producer and an editing assistant for the brand’s TV shows. 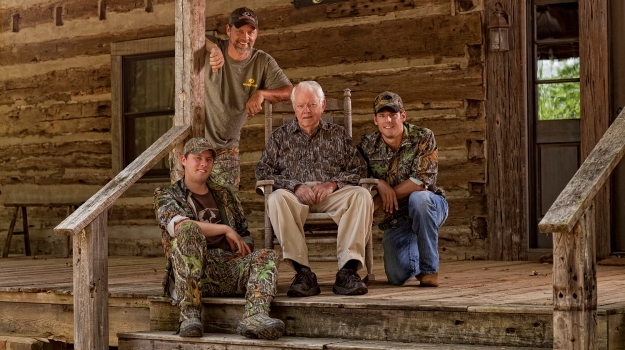 “My dad, Toxey, and my granddad, Fox, have taught me everything I know about hunting and the Mossy Oak Company – from the basics of the business to why there is a Mossy Oak,” Neill Haas says.